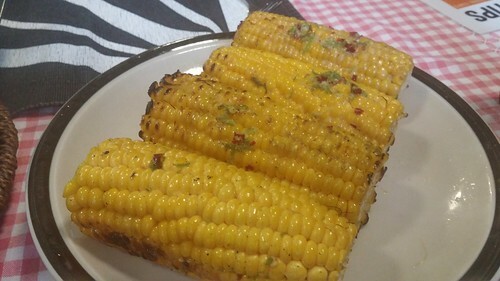 I backed Rich Evans’s BBQ Secrets: Summer BBQ Guide on Kickstarter because it’s always great to have new ideas for making BBQs more interesting, and we’ve already incorporated one of the recipes (the corn below) into how we cook BBQs permanently. There are more recipes in here I want to try (except for the seafood, because that’s not for me). If you want a copy yourself, I note that there appear to be several sites where you can download the book, and as I don’t know whether they are with or without Rich’s permission, I haven’t linked to any of them. The link above is the to the Kindle edition at Amazon. This is a good book with helpful suggestions as to what type of BBQs the recipes work best on (wood, gas, electric), a great range of meat, seafood and vegetarian recipes, some side dishes, and marinades and sauces. I enjoyed cooking from it, and will go back for more. Overall 4.5 stars out of 5. Add all the ingredients to a blender or spice mixer and blend until combined. Pour in olive oil slowly to loosen the mix. Marinate the lamb chops in some olive oil and half of the mint pesto for 30 minutes. Place the vegetables in a bowl, drizzle with olive oil and add the crushed garlic and some salt and pepper. Heat the BBQ grill to a medium heat. Place the chops and vegetables down on the grill. Turn the chops every 2 – 3 minutes for about 12 minutes, basting with a little extra pesto at each turn. Turn the heat off and close the lid for about 3 – 4 minutes to let the chops rest. Then top with the remaining pesto and serve with the vegetables. 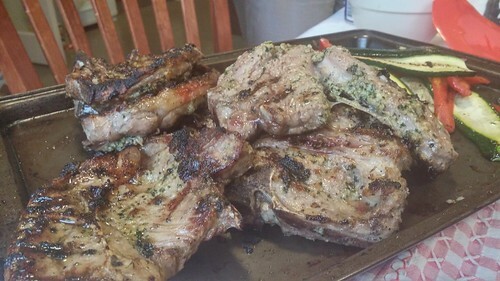 It is very likely that your BBQ will catch on fire, slightly, due to the amount of fat from the lamb, and oil from the pesto. Despite that happening to us, the recipe was delicious, and the lamb amazing. Trim the stalks out of the mushrooms and wipe off any dirt with paper towel. Place the olive oil, chilli flakes and chopped coriander in a bowl or tray big enough to place the 4 mushrooms in, and mix. Lay them skin side down in the oil and let them marinate for a minimum of 20 minutes, turning a couple of times. 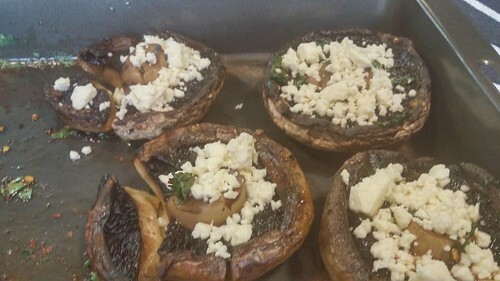 Heat up the grill on your BBQ to a medium heat and place the marinated mushrooms down on the grill. Cook for 5 minutes on each side until it is tender to the touch. Fill with goats cheese and serve. I don’t like mushrooms and this smelt amazing. I used feta as I couldn’t find goats cheese on the day. According to the people who ate it, it was really good with feta, and would be great with regular goats cheese also. Mix together some butter (I use between 50g – 100g depending on the amount of people I’m cooking for), with the zest of one or two limes (depending on size of limes) and about 1/2 a teaspoon of chilli flakes (or more if you like them). Wrap the corn tightly in aluminium foil and put in the fridge for 10 minutes. Cook the corn, still wrapped in aluminium foil, for 10 minutes each side, at the back of the BBQ plate. Remove the corn from the foil and place on the grill over direct heat for 5 minutes, brushing with butter as you turn. Serve with remaining chilli, lime butter. We’re now cooking corn with every BBQ using this recipe. It’s delicious and easy, and despite the chilli lime butter recipe being very vague, it works every time.